After our 90 minute mash we increase the mash temperature to 168F and hold for 5-10 minutes to further dissolve the wort sugars. This is called the 'mash-out' and helps make the grain bed and wort more fluid for the next step (sparging). This is most beneficial on setups with smaller mash filters/false bottoms as it helps in getting the wort flowing more easily, avoiding stuck sparges. We've experimented by skipping the mash-out step on our Electric Brewery setup and have not experienced any difficulties with sparging, even with sticky mashes composed of 70% wheat malt. At the 168F mash-out temperature all enzyme action is also stopped, effectively preserving or 'locking in' our beer's sugar profile so that no further changes can be made. 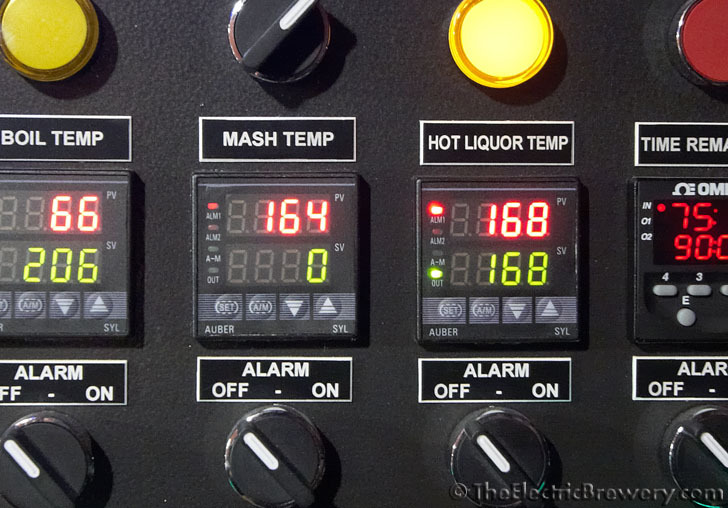 Press the UP button on the Hot Liquor Tank PID until the lower green number reads 168F. The Hot Liquor Tank will rise to 168F and the mash will follow. It takes approximately 20 minutes for the mash to reach mash-out temperature. There is no need to move any hoses or adjust any valves. Keep the Mash/Lauter Tun and Hot Liquor tank lids on throughout the process to minimize heat loss. If brewing indoors you may want to run your hood fan at low speed to exhaust any excess heat. OPTIONAL ALARM: You may set the Mash/Lauter Tun alarm to sound once the 168F mash-out temperature is reached. Press and hold the SET button on the Mash/Lauter Tun PID until ALM1 is displayed. Press the UP/DOWN buttons until 168 is displayed. To exit the setup menu, wait 10 seconds. Turn the Mash/Lauter Tun ALARM switch ON. When the mash temperature reaches 168F the alarm will sound. Turn the Mash/Lauter Tun ALARM switch OFF to turn off the alarm. Mash-out is a good time to acidify the sparge water (if required). To avoid excess tannin extraction from the grain husks, we want the sparge water pH to be below 6.0 (when measured at mash temperature), preferably in the 5.6 to 5.8 range. Take a pH reading by placing the probe tip of the pH meter in the Hot Liquor Tank. If the water is well above 140F you may want to extract a sample and wait for it to cool slightly first. (The pH meter we recommend automatically compensates for temperature but only up to 140F). To lower the pH, add some 88% lactic acid half a milliliter (mL) at a time, wait a few minutes for the acid to recirculate and mix, and re-measure. It usually only takes us one or two milliliters at most in 10-13 gallons to get down into the 5.6 to 5.8 range. All water is different however. Once you know how your water reacts, you'll be able to adjust it without having to measure the pH every time.